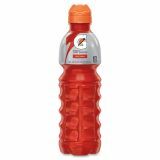 Gatorade Thirst Quencher Red Sports Drink - Thirst quencher contains a proprietary formula of electrolytes, carbohydrates, and flavor to provide the optimal hydration solution to use before, during, and after training and competition. Electrolytes help regulate a number of body functions, and athletes who suffer from a substantial electrolyte deficit may experience muscle cramping, heat stress and fatigue. Gatorade replenishes fluids and provides electrolytes and carbohydrates for fast rehydration and energy boosting. Gatorade comes premixed in a convenient 24 oz. sports bottle.